Find and compare the best prices from a range of well known car rental companies at Heraklion Airport. This is a free to use facility, enabeling you to book direct with the company quoting the price. 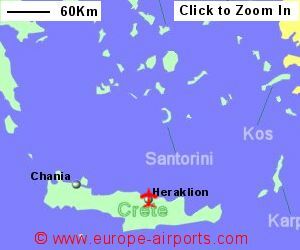 Heraklion is the busiest of the two airports on the island of Crete, the other being Chania. 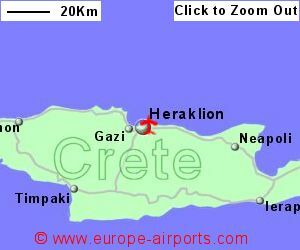 A bus from the airport to the centre of Heraklion will cost around 1 Euro for the 20 minute journey. Taxis are available and are likely to cost around 20 Euros for the trip into Heraklion. Heraklion is a small but busy airport and has 6 bars/cafes/restaurants, 5 shops, an ATM, baby changing facilites, and a VIP lounge. 7.4 million passengers passed through Heraklion airport in 2017, a 9% increase from the previous year, and keeping it the 2nd busiest airport in Greece.